Plyometrics are exercises that involve jumping, starting, stopping, and changing direction. Muscles exert maximum force in short intervals of time. Plyometrics are commonly used in addition to a strength routine to increase agility and explosiveness. 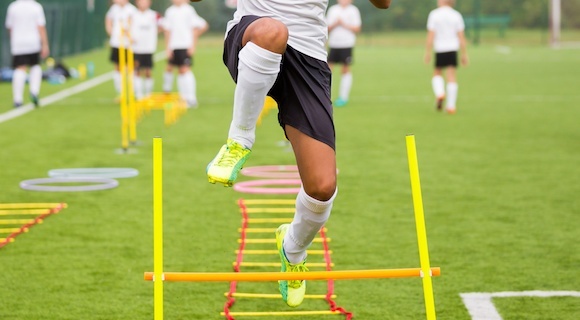 Research shows that plyometrics increase an athlete’s agility and quickness. Increased agility is extremely beneficial for all athletes including football players, distance swimmers, and Olympic bobsled pushers. In football, it will help offensive players develop a quick first step, making for an easier transition around a defensive player. In swimming, it directly relates to quickening reaction times when jumping off blocks and pushing off walls. It helps bobsledders develop an explosive start, which could make the difference of standing on the podium or not. This benefit of increased agility and explosive power is a result of an increased stretch shortening cycle (SSC) ability. SSC is characterized by lengthening the muscle (plyometric exercise) immediately following a muscle contraction (weight training exercise). Plyometrics in conjunction with traditional weight training can maximize SSC ability and help improve athletic performance. How to Incorporate Plyometrics in Strength Training? Plyometric training can be incorporated into your strength program to produce a more complete training routine. A common way into introduce plyometrics is to pair a traditional weight lifting exercise with a plyometric exercise. The addition of an explosive exercise (ex: box jumps) paired with a standard weight exercise (ex: squat) will improve an athlete's SSC ability, thus improving their explosive power. Below is a list of common pairings of weight exercises and plyometric exercises. The use of plyometrics in a strength and conditioning program is key to building better athletes. Not only can this combination increase an athlete’s agility and muscular explosive power, but also improve joint awareness and overall proprioception. Plyometrics should be incorporated in strength training routines for all elite athletes looking for improvement. To learn more about enhancing athletic performance check out these articles on designing a program and avoiding overtraining syndrome.